Energy No Mess - Simply Bird Garden Birds Supplies. This is a premium mix, high in energy, formulated for year round feeding. 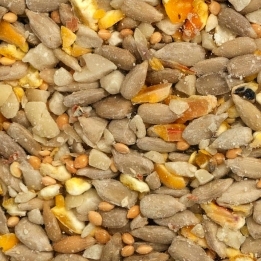 The blend of premium quality sunflower hearts and peanut granules will not only attract the widest variety of birds but provide them with the highest calorific value of any seed mix in our range. Containing no husks it is 100% edible and that means no mess will be left behind. Its free flowing qualities make it perfect for offering in seed feeders but it can equally be used on the ground or table.High quality the best and most fashionable online of the replica watches store. Sunflower hearts, maize, peanut granules & millet.